If there is one thing that you may be surprised to learn about me it is that I love a good boxed mix. Yep, the girl with her own blog all about food and will try making anything from scratch is not afraid to make cakes, cupcakes, brownies (I draw the line at cookies) from a boxed mix. There are times where a cake mix or brownie mix will do the trick. And in some cases, maybe even better than what you can make from scratch. There is one exception, though. And that is strawberry cake. A good, fresh strawberry cake just can't be replicated through a pre-packaged mix. Trust me, I have tried. When preparing to make my flower heart cake last week I came this close to making the cake from a box. But I just knew that it wouldn't taste the same (even though the cake was only going to be eaten by me). So I set out to make my very own homemade strawberry cake using real, fresh strawberries and none of that artificial flavoring that just doesn't quite taste the same as the real deal. As I mentioned above, the foundation of this cake is real strawberries. The problem is that real strawberries are just a wee bit moist. While we want our cake to be super moist, we don't want it that moist. Have I said moist enough? Moist, moist moist. 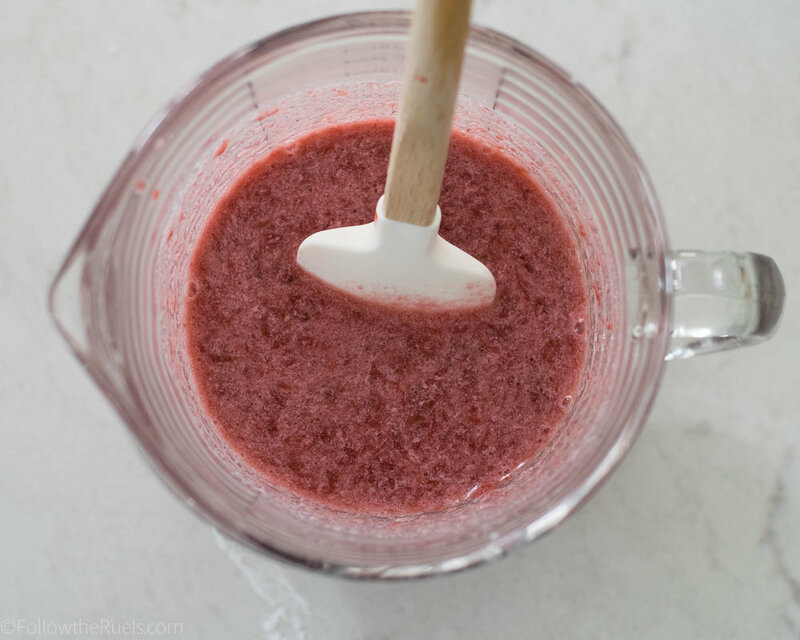 To get that a concentrated strawberry flavor, you will want to reduce the strawberries down into a nice thick strawberry syrup. To do that, place about 1 1/2 to 2 cups of whole fresh or frozen (and thawed) strawberries in a saucepan over medium heat. Allow all their juices to start flowing out and boiling down. Once they get warm, you can easily mash them up with a fork, pastry cutter, potato masher, etc. Keep the mixture at a low simmer until it reduces by half our more. You will know it's ready when the strawberry sauce coats the back of a spoon. While the strawberries are getting all hot and bothered, you can work on prepping the rest of the cake mixture. You will need some flour (all purpose is just fine), sugar, baking powder, salt, butter, eggs, milk (whole, please), and vanilla. Start by creaming together the butter and sugar until the butter is super light and fluffy. I know I always say that, but it's really important that the butter gets to this stage so that it's evenly incorporated throughout the batter. You don't want little bits of butter randomly scattered through the cake. Add the eggs one at a time. Beat until each is just barely incorporated, then add the next. Once all the eggs have been added, mix until the eggs have fully combined with the butter. You don't want to over mix them, however, so stop as soon as butter and eggs have formed one cohesive mixture. Then add in your vanilla. And don't forget to scrape down the sides of the bowl and the mixer so that everything is evenly mixed. That butter on the paddle attachment is just dying to be scraped into the bowl. Prep your dry ingredients (flour, baking soda, and salt) by whisking them together for a few seconds. You will be sifting them into the butter and egg mixture in a second, so no need to go overboard. By now, the strawberries should be reduced to a thick sauce. Mix the milk into the strawberries. Now for the fun part! Alternate mixing the dry ingredients with the wet ingredients, starting and ending with the dry stuff. I know from the pictures it doesn't look like I added the dry first, but I promise I did! As you add more and more of the strawberry mixture, your batter will get pinker and pinker until it's a lovely shade of light pink. If you really want this to be a pink cake, you could add some food coloring, but I think the natural shade of the strawberries is lovely. I prepare my cake pans by lining the bottom with a piece of parchment paper cut into a circle, they spraying the pan with some baking spray. This makes it super easy to remove the cakes after they have baked. After the cake has baked and cooled to room temperature, pop them in the fridge to chill which will make icing them much easier. I also like to level my cakes and trim off the caramelized bits, but that is just a personal preference and totally unnecessary for a delicious cake. From here, you can decorate your cake as you like, but I will tell you this cake is delish with some cream cheese frosting, which is exactly what I did. If you are more of a buttercream person, I've got you covered, too. Once bite of this cake and you will be converted from that box mix cake to the real deal homemade strawberry cake. Save the box mix for that vanilla cake! Preheat oven to 350 degrees F and prep 2 round cake pans. 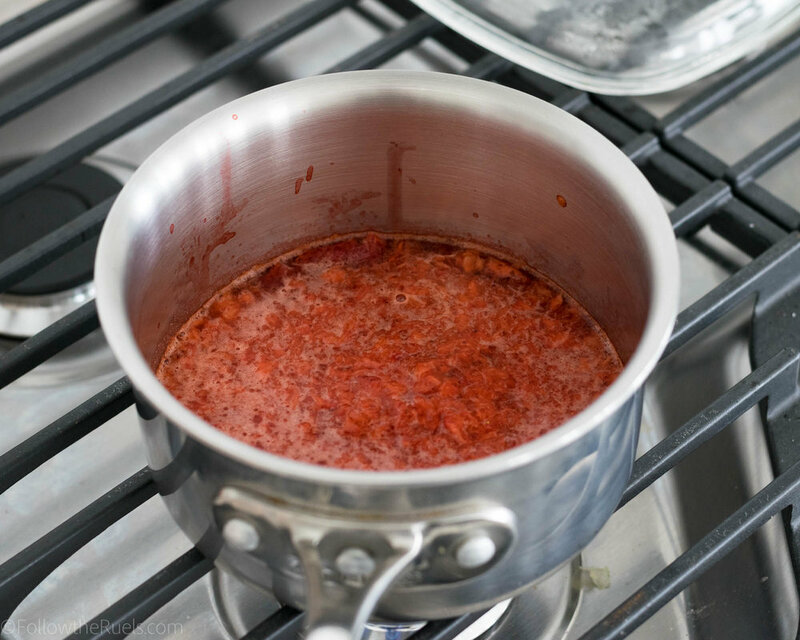 In a small sauce pan over medium heat, reduce strawberries to a thick sauce. Once warm, smash the strawberries with the back of a fork or potato masher. Let simmer for 5 to 10 minutes. Meanwhile, in a large bowl whisk together flour, baking powder, and salt. Set aside. 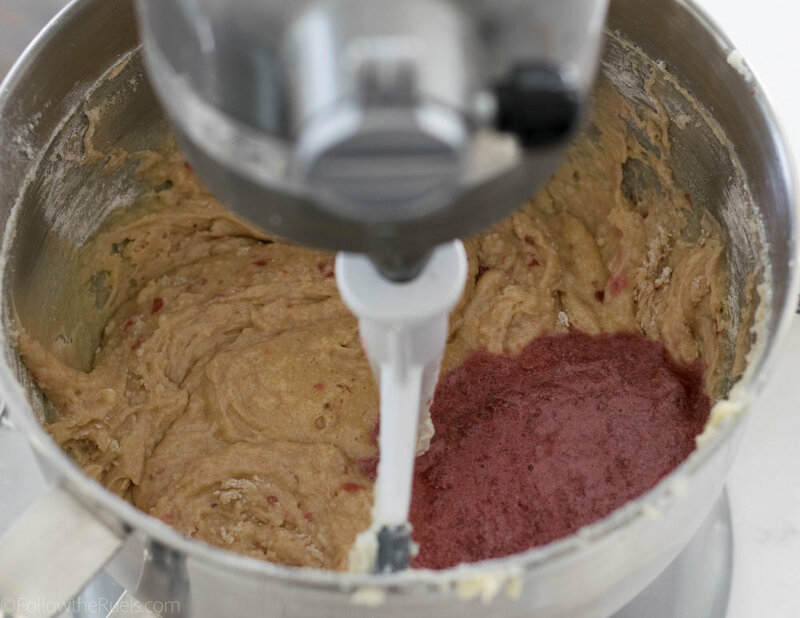 In the bowl of a stand mixer, beat together butter and sugar until light and fluffy. Add in the eggs one at a time, then mix until fully incorporated. Scrape down the sides of the bowl then mix in the vanilla. Measure 1/2 cup of the strawberry concentrate and mix with the milk. Add in 1/4 of the flour mixture to the butter and egg mixture. Mix until combined. Pour in 1/3 of the strawberry-milk mixture and mix until combined. Repeat until all the dry and wet ingredients have been incorporated, ending with the remaining dry ingredients. Pour the batter into the prepared cake pans, and bake for 20-25 minutes, until a toothpick poked into the center of the cakes comes out clean.